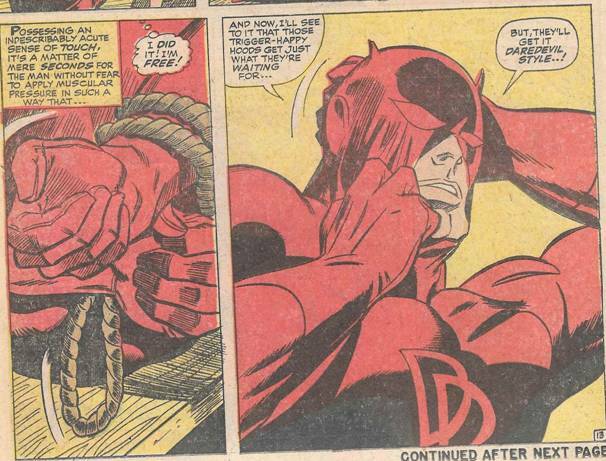 What the hell is up with Daredevil's mask!?! It seems fitting as Halloween approaches to address one superhero's fashion sense. Don't get me wrong, Daredevil (Matt Murdock) is a pretty cool character, he's got that grim and gritty vibe that's spawned some truly great stories over the years. But early in his career, we're talking the 1960s, there was a lot that was just plain odd. Better people than I have covered these shenanigans on the internet, such as Daredevil pretending to be his own twin brother, or the choice of a bright yellow and red costume for his nocturnal battles. Seriously, just do a web search and you'll see what I mean. But as you can glean from the title of this article, today I'm more interested in one specific garment choice from our hero. 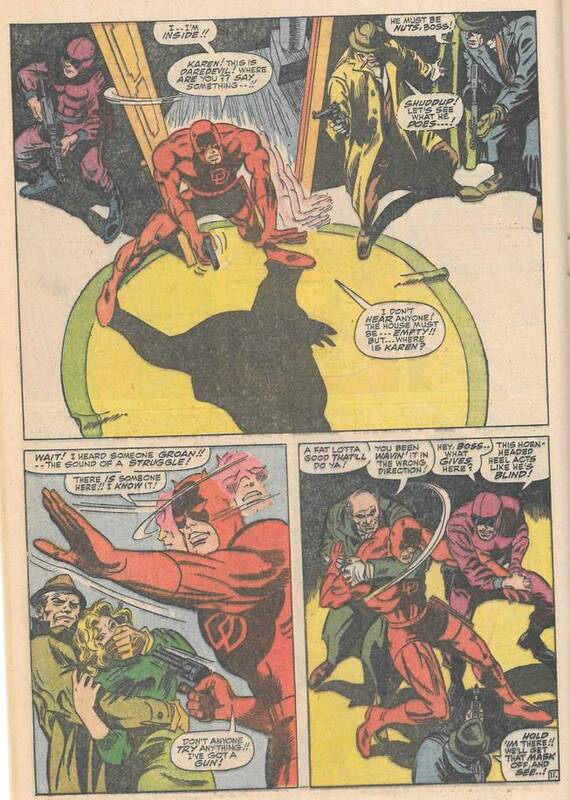 Being the 1960s and having a plethora of superheroes paving the way, of course Daredevil required that old superhero standard, the adoption of a dual identity to protect his family and friends from their enemies - and to provide a constant plot point for dramatic development in his life. The dual identity can give a certain noble quality to the superhero's character, the idea of thinking of others ahead of themselves, an idea of the hero trying to stay one step ahead of his foes. Then you come across the cover of Daredevil #29 and realize that your hero is a freaking idiot. No, I'm not referring to the bright red "DD" on his chest, his very important logo so that people don't get him confused with that other all red clad superhero who beats people with a Billy club. That or he's a big fan of Dr. Dolittle. 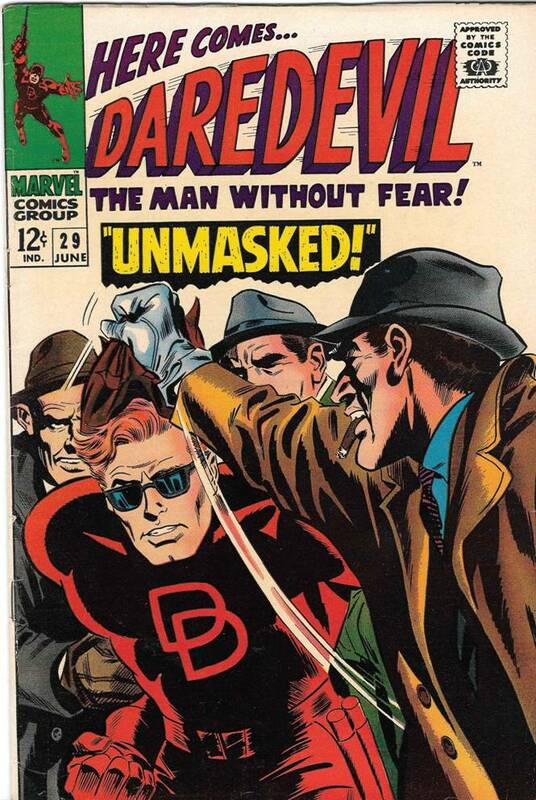 No, what I'm referring to is the fact that Daredevil, a blind superhero, wears his blind man glasses under his mask. Let me state that again. The man wears his glasses under his mask. Glasses that mysteriously vanish whenever he puts on his form-fitting face mask. It's ridiculous in a nutshell. Being the 1960s it was considered something of a stereotype in media that all blind people be forced to wear dark glasses to, I don't know, mark them out to the rest of society I guess? 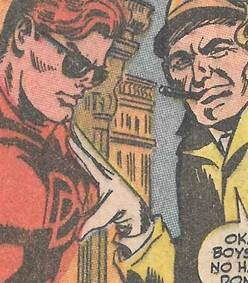 I don't really get it, but it seemed necessary that whenever Matt Murdock was present he had to always have glasses on. Didn't matter what he was doing, where he was, the glasses were always there. 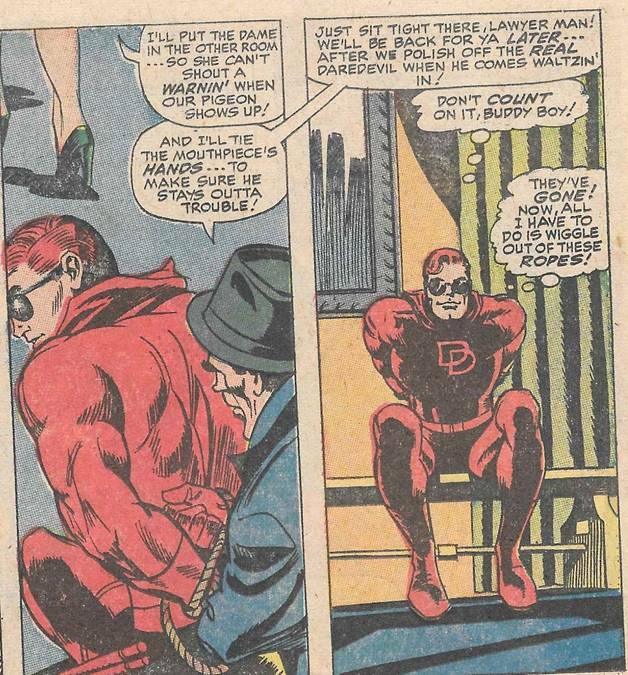 In this issue for example, Matt could be seen working out in his Daredevil costume with his mask off and sure enough, he was wearing glasses. The issue itself is a standard Daredevil tale - the criminal element have once again connected Murdock's law office with Daredevil and set a trap for him by kidnapping his secretary Karen Page (again). To mix it up this issue, they decided not to kidnap Matt's law-partner Foggy Nelson, giving the guy a rare day off. You know, for a guy trying to protect his friends with a double-identity, ole Matt sure does a piss-poor job of it. 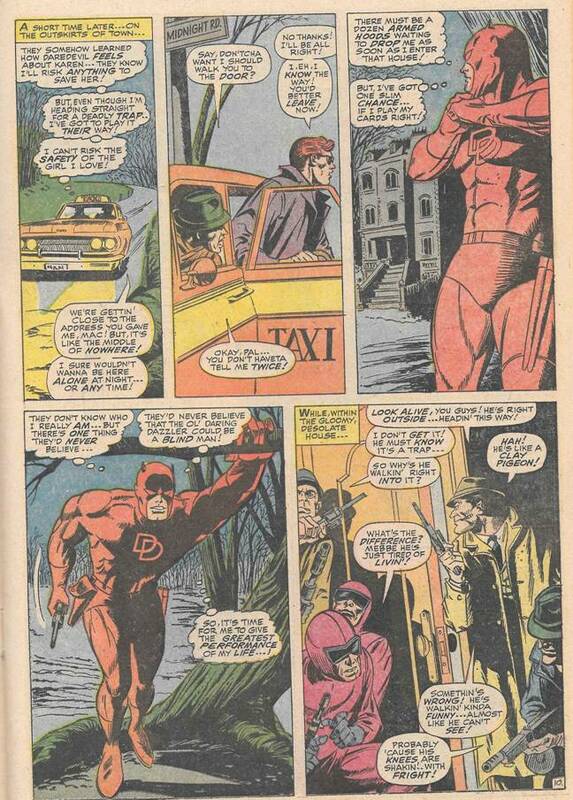 You'll notice that Daredevil's glasses magically disappear. You'll also notice that some of the villains are wearing their goggles over their face mask. 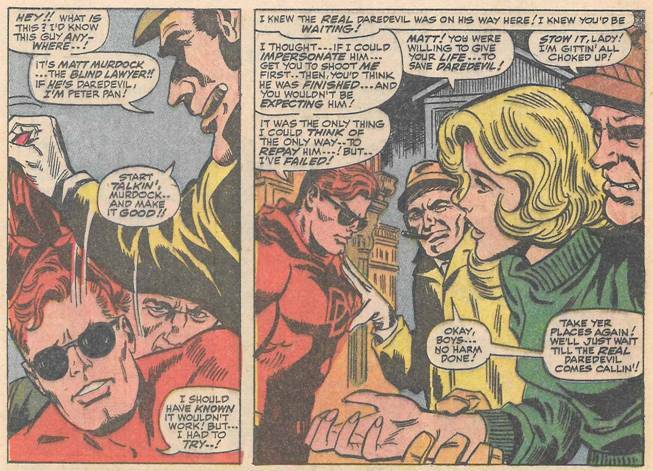 Good thing Daredevil was wearing his blind man goggles otherwise they'd never have known he was Matt Murdock, the blind lawyer under there. 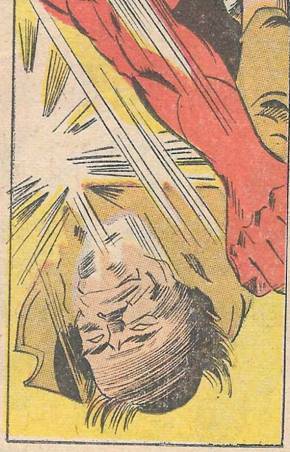 Without the glasses they might've thought it was his twin brother Mike Murdock, the guy Matt pretends is the actual Daredevil, and just shot him. Of course they could've just shot him anyway. ...and promptly frees himself. Obviously the crook never got his junior merit badge in knot tying. It's maddening when you can see that the artist took the effort to draw Daredevil's ear beneath his mask - but the glasses? Gone to the Satan's pit that spawned them, I guess. Daredevil fun fact - the sound of a skull exploding under a man's feet is "BTOP!" Daredevil fun fact - Sometimes skulls just explode like a ruptured bag of confetti, silent and messy! Good lord, what did he do to this poor man? His entire chest exploded!!! Holy crap man, just stick with the head exploding because that above... that's just awful.